We've gone through the top retailers such as Amazon and Walmart to find the best cheap TV sales and deals that are currently going on (we've also got a roundup of UK retailers). You can find Black Friday like prices on a variety of best-selling 4K TVs from brands such as Samsung, Sony, LG and more. You'll find discounts on 4K TVs, smart TVs, different model sizes, and a variety of prices that will fit any all TV viewing needs. You will find all of our curated deals below. 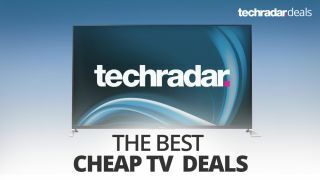 We've divided them into three different size categories as well as our pick for the best cheap TV deal of the week. These days you really don't have to pay much more to get a Ultra HD 4K set instead of an older-style HD one. If you're after the hottest tech in TV though, you may want to take a look at the cheapest OLED TV prices. Whether you want a small TV with a price tag to match or something to show all the colors of the rainbow (and a few million more) with HDR, we've found plenty of options. Read on to find the TV you want at a great price! A midsize Smart TV option, this 55-inch set is also a good gaming TV, as it features a mode designed precisely for that. Plus, it comes with HDR for a great picture. Best of all, it's more than $400 off the regular price. The LG OLED65E8PUA features one of the thinnest 4K panels on the market. On top of this, the 65-inch TV is equipped with an a9 Intelligent Processor that's designed to process and render rich colors, sharpness, and depth to deliver ultimate picture quality. If size is of the utmost importance, here's an affordable 75-inch option. At this price, you won't get a lot of features, but you will get a lot of square-inches. Walmart is selling it for nearly half of its list price. The lack of a smart app for streaming hurts a little, but you could always pick up a cheap Fire TV Stick to go with it.